$21999 Demo SpecialOne of the best sets of amplifiers available. They have the musical magic of the 300B tube (one of the best audio tubes) along with the power and bass definition you don't normally get with 300B amps. They are massive, beautiful, powerful, and amazing. The sound quality is easily better than any solid state design and most tube designs as well. These are statement pieces. These are at Canary headquarters in Covina, California if you want to pick them up there. The owner of the company told me that this particular set he made for himself and are as good as he could possibly make them. (He put ultra high end components in key places so this is not the same as a stock Ref 2 mono block pair. The sound quality offered here will be hard to better at any price). These are a demo pair with a few hours on them. Retail on these top of the line mono blocks is $42,000 without tubes. As a bonus, I will include a full set of audiophile tubes including the excellent Psvane 300B tubes. I will also upgrade to audiophile fuses as well if you want. Once you hear these amps, you will stop looking for the next best thing--you will already have it! These amps are already a legend in Asia and England. There are two nicks at the top edge of one of the amps. I have all of the Canary products available for sale. I am an authorized dealer for Oracle, Auralic, Resonessence labs, PS Audio, Verastarr, NAT Audio, and Triangle Art. Paypal and CC adds 2.9%, Midwest Audio, Mishawaka, Indiana. Canary Audio is proud to introduce the all new Reference Two Monoblock amplifiers, the first of a whole new series of high end reference audio products. The Reference Two is the result of over 15 years of experience. 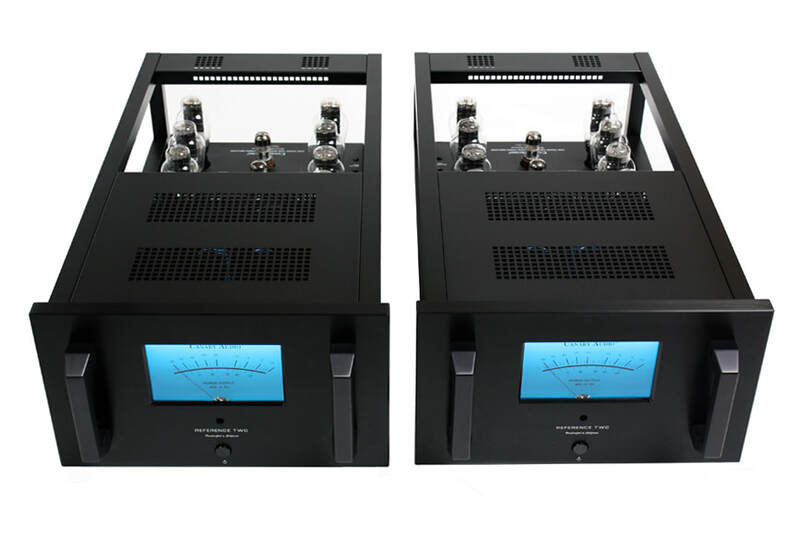 Built to Withstand the Power of Music: The REFERENCE TWO is a monoblock amplifiers with the use of sixteen (eight matched pairs) 300B triode tubes in a push pull parallel circuit. Like all of our other amplifiers, only the highest quality parts and components are used. The oversize custom wound power and output transformers are specially designed to extend the bass and highs. Each of the transformers is housed in a metal can filled with epoxy. Two independent chokes are employed for rectifier filtering on each channel. Just as important, the military grade epoxy circuit boards are designed to minimize component interaction. In addition to that, each of the 300B triode tube has a separate bias adjustment device mounted on the rear panel for convenient biasing. The World Most Powerful 300B amplifier: Generating power from eight pieces / four matched pairs of 300B tubes per channel. Conservatively rated with an output voltage of 80 watts RMS. The Reference Two is capable to deliver high power wattages and still maintains the clarity and delicacy of real music. Anyone who listens to them never feels the need for more wattage, all they want to do is put on more music. Perhaps the Reference Two is the most powerful 300B amplifier in the world. Newly designed high voltage power supply. The input circuit has been redesigned to be faster and more dynamic. Balance Input is available for balanced connection. Exclusive machined Delrin 300B tube sockets with gold plated pin receptacles. Specially designed power meter with a custom backlite LED display.